A building is only as good as its design. Our full-scale architecture department is led by a principal of the firm. The team has designed award-winning projects throughout Central Florida. Whether it is professional offices, medical clinics, schools, churches, fire stations, recreational facilities or multistory buildings, we have the capabilities to design your dream building. Our design process includes evaluation of building needs, master planning, regulatory review and codes review, preliminary design and estimates, scheduling, value engineering, construction documents and final competitive bidding and estimating. The McCree engineering team is also led by a principal of McCree. The engineers provide construction expertise during the design and estimating phases for constructability and budget recommendations. Our engineers inspect the plans of every project to ensure that nothing is overlooked and we give you the most accurate estimate. 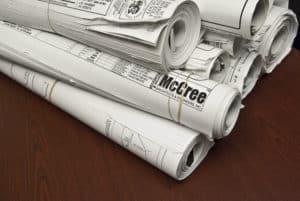 Two of McCree’s owners are registered professional engineers—combining the civil, structural and mechanical engineering disciplines. This advantage allows McCree to recommend true solutions as opportunities arise in the field and speed of solution—saving you stress, time and money.